1) Focus. My lens was consistently needing to be refocused. This is something I heard from other photographers as well. I assume this must be due to the changing temperatures from sitting in the sun, but the problem didn’t seem to go away. This was really a problem when I removed the solar filter for totality. In the heat of the moment I failed to think about focus until it was really too late. This had a negative effect on getting critical sharp images during Bailey’s beads and the diamond ring. Next time I will check as often as I can. 2) Bracketing during totality. My 7D mkii is equipped to take serious bracketed shots. Unfortunately, I failed to review how to do this automatically prior to the eclipse. I could have taken ~14 tightly bracketed shots in no time during totality. Instead, I barely pulled off three or so that were probably too widely spaced to create the final composite I was hoping for. It wasn’t a complete wash, but it could have been so much better. 3) Importance of aperture. I wasn’t thinking much of totality when I chose the aperture that I did. 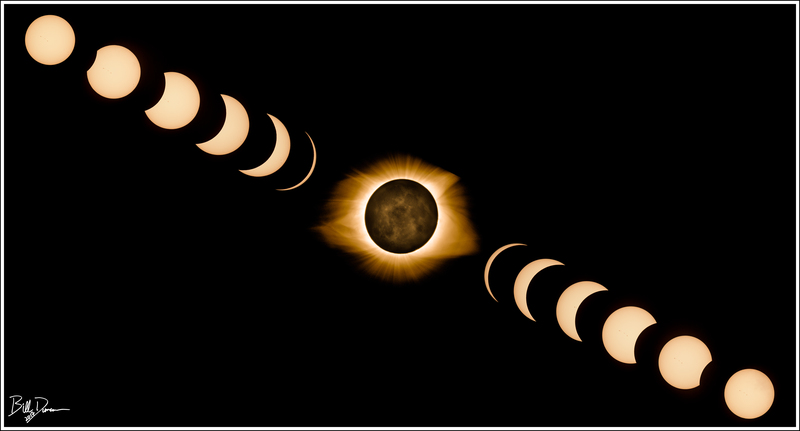 During totality, it is much more important to pick a smaller aperture that will get you those nice starbursts and critical focus then to worry about letting in more light to avoid digital noise. This will also help with focusing in general and getting sharp focus of the solar flares. I’m sure there are other improvements I could make. With about 7 years to prepare, I won’t make the same mistakes again. 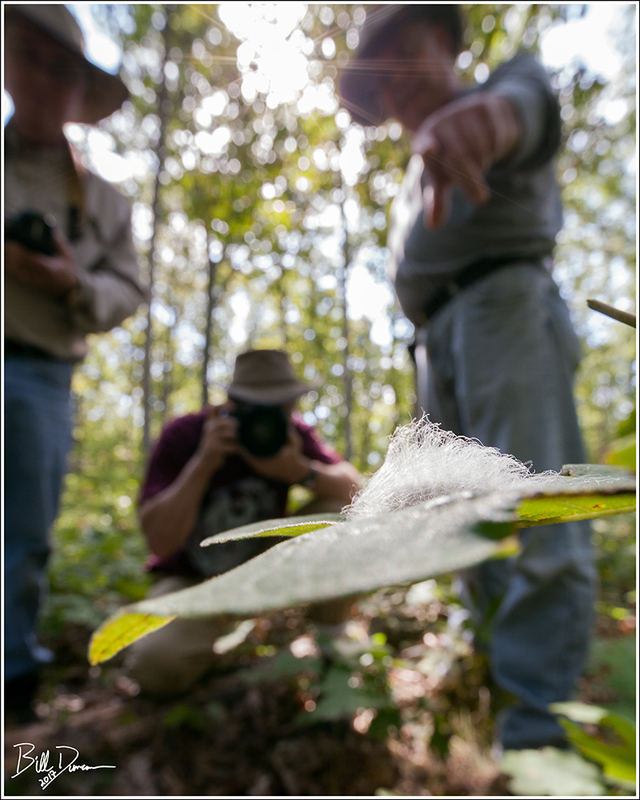 The WGNSS Photography Nature Group met at Cuivre River State Park on Saturday the 2nd in hopes to find members of Limacodidae (slug moths). Perplexing to me, we struck out in the same time and place I found them in numbers and diversity a year ago. It was still a good time. We found a number of other macro subjects and explored a couple of new places. I also got to give a first spin to my new lens. A wide-angle macro – the Laowa 15mm f/4 Wide Angle Macro. A rather new lens design and one with a pretty steep learning curve, these photos are really just practice. With time and strategy, I think I can get better at this. 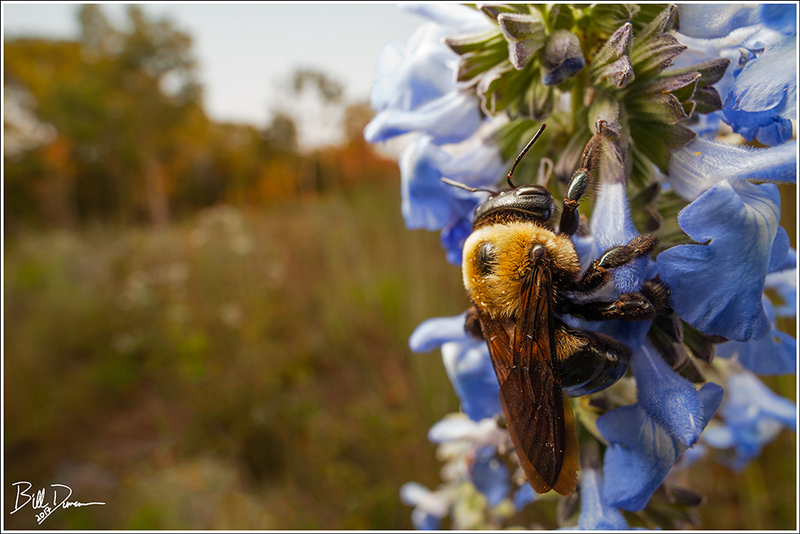 1) Getting a better handle on exposing for the environment (background) while getting the right amount of light from the flash to properly expose the foreground macro subject. I think this should be easier to predict with practice. I’m not at all sure that I can ever get it on a first try. 2) Figuring out how much dof is just right. Sometimes getting more detail in the background will be desirable. Other times, it is best to blur it out to bring focus on the primary subject. This is a funnel web or grass spider (Agelenopsis spp.) 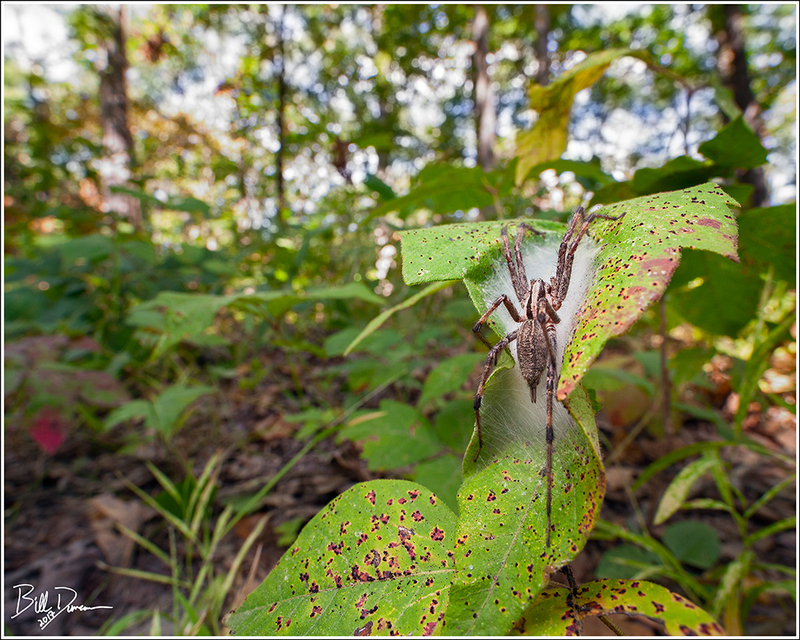 that we found protecting her egg sack on the leaf of poison ivy (Toxicodendron radicans). She will likely guard the eggs here until the winter takes her. Grass Spider – Agelenopsis spp. One of the nice finds of the day was this Black-waved Flannel Moth (Megalopygidae – Lagoa crispata (4644)). One of the key features of this lens is being able to focus close enough to the primary subject for macro-level detail while capturing so much more in the subject’s environment. In this case, I tried to give the perspective of what it may be like for the bug when being discovered by entomologists or nature photographers. Pictured left to right are WGNSS members Rich Thoma, Dave Seidensticker and Casey Galvin. After the group disbanded at Cuivre River SP, Miguel Acosta and I decided to visit and explore Little Lost Creek Conservation Area near Warrenton. We hiked about 6 miles and I camped there the following evening. 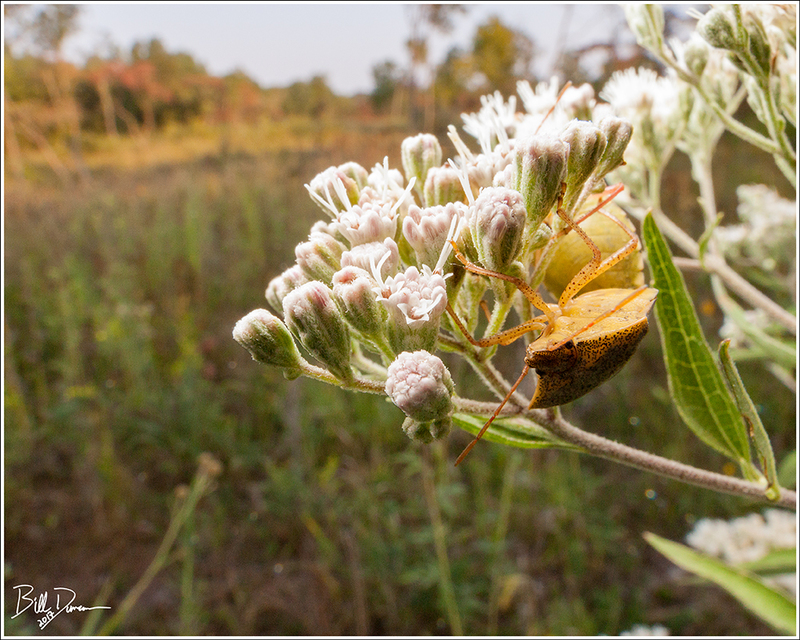 I took a quick photo hike in the morning and found these two Brown Stink Bugs (Pentatomidae – Euschistus servus) in copulation. They didn’t like that lens being so close and kept moving to the opposite side of the boneset (Eupatorium) blooms.